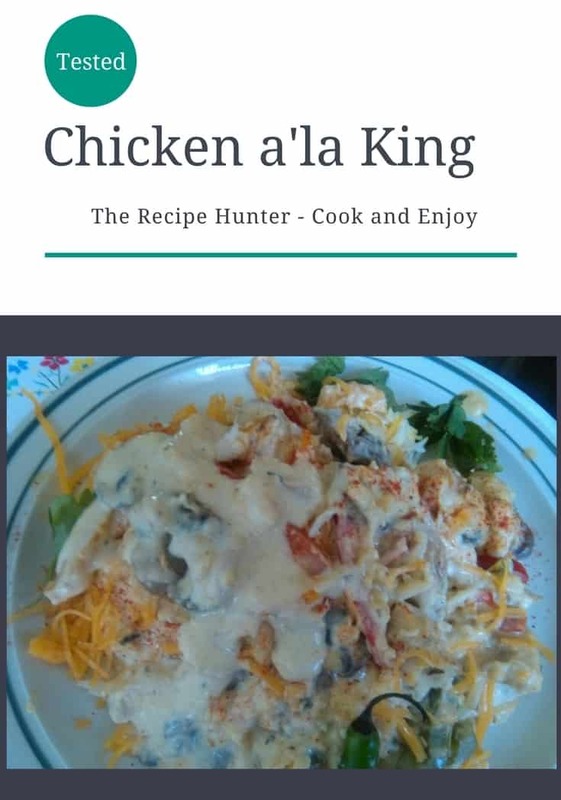 Chicken à la King is a dish consisting of diced chicken in a cream sauce, and often with sherry, mushrooms, and vegetables, served with rice, pasta, or bread. Add chicken breasts to a pot with water seasoning salt, chicken stock powder, and oregano. Bring to a boil then simmer gently till cooked. In the meantime slice all vegetables. Remove chicken and either shred roughly or slice. Add 2 tbsp butter and olive oil to a large pan. Add onion and fry 1 minute. Add peppers and fry a few minutes. Once mushrooms coated add chicken and mix through, in the meantime make the sauce. Once melted, remove from heat and stir in flour till smooth and golden. Return to heat and whisk in cream. Add seasoning and stir till thickened. Stir in parmesan cheese. (If using cheddar remove from heat and stir in cheddar till melted). Pour over chicken and vegetables and heat through. Sprinkle some paprika before serving.